That was not a 15-meter anaconda! It’s not fake, but it’s been stretched from a vertical cell phone video to fit a 16:9 format. I’ve now seen the original video. It’s crossing a road (not a stream), it’s not swimming, the guy filming is walking (not in a boat). It’s a big snake, but on the order of 5-7 m, not 15. Readers found this, and I’ll put it together into a post for tomorrow afternoon. davelenny, judging by the ruts in the road, figured the snake to be less than 3 car widths long (which would be less than 18 ft. for a 6 ft. wide vehicle such as a Jeep or Land Rover. Michael Fisher, noting that the ruts are likely to be 60 inches apart, so that the road would have a width of 10 ft., suggests a total length of 12-15 ft. (ca. 4-5 m) for the snake. Jeeps/trucks have wider axles (65″ for a Toyota Land Cruiser), and the flooded section of the road where the snake is is a bit wider than the rest of the road, so I’d go a bit larger than Michael. My initial guess of 5-7 m is probably not way off, but I would lean more toward the lower end of that range. 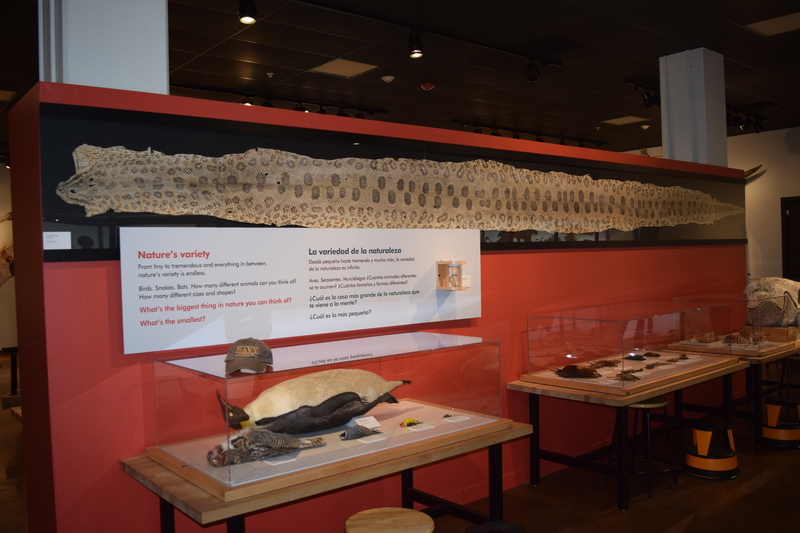 Next, there’s the size of the anaconda on display at the San Diego Natural History Museum. It is about 22 feet, which I figured out by measuring the floor tile length using my feet (my feet, shod, are one foot long, as I’ve verified on many floor tiles and soccer fields), and then counting the number of floor tiles from one end of the snake to the other. Anaconda on display at the San Diego Natural History Museum. My hat, which placed in the picture for scale, is 7-8 inches across. Michael Fisher, using the hat, came up with 20 feet, which was the closest of any reader, and given the angle, a pretty good estimate. So, with a 20% stretch, the live length would be 18.3 feet, which is spuriously precise, so let’s say 18 feet. 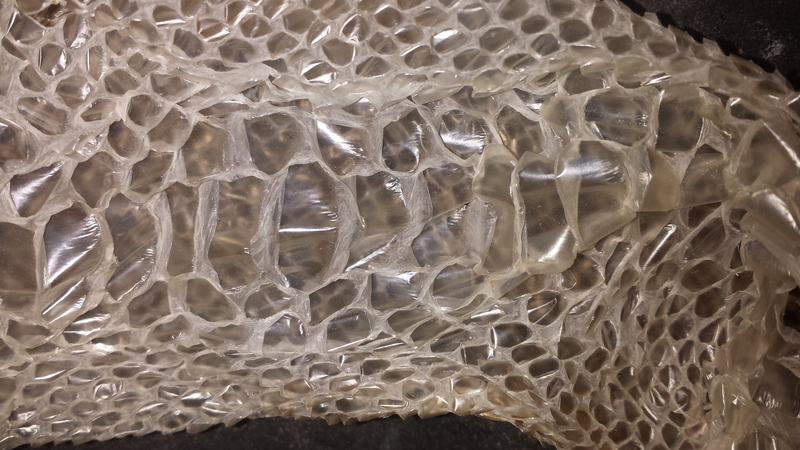 Shed skin of ball python (Python regius), ca. 1.2 m total length. Note that the shed skin is translucent and nearly patternless; it is also much lighter (in weight) than an actual skin, which is what is on display in San Diego. 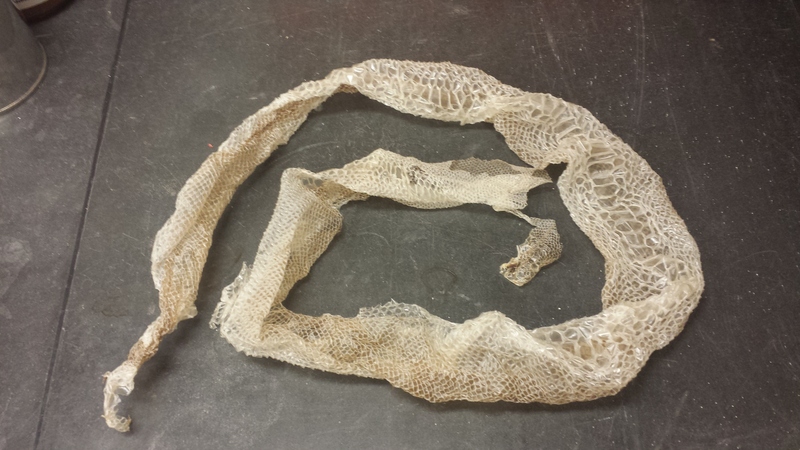 Shed skins are only rarely taken as specimens for museums, usually only to document very uncommon species or occurrences. The above is a shed from my ball python, Vyvyan. Below, you can see the skin between the scales. The scales are nearly transparent, but the skin between is more opaque; it is this opaque skin that gives a skin its “stretch”. This entry was written by whyevolutionistrue and posted on March 15, 2019 at 11:15 am and filed under herps, reptiles with tags anaconda, ball python. Bookmark the permalink. Follow any comments here with the RSS feed for this post. Post a comment or leave a trackback: Trackback URL. Not a 15m anaconda, but the question remains, can they actually reach 15m, or even more? I like to think so, but that is never a good guide (probably the child in me). However, the fact they are predominantly aquatic means there are basically no physical barriers to these humongous sizes. I think that at present a max size of 11-12m has been established. I see with satisfaction that a clear distinction is made between a shed mould and an actual skin now, something (as I pointed out) that appeared a bit unclear in earlier posts. It’s sad that the video that Michael Fisher tracked down which looks to be the original video has not yet reached 100 views but everyone who has uploaded copies of it are getting thousands and millions of views! It’s up to 177 now. Must be mostly WEIT readers! Greg, I think it is great that your foot is exactly one foot. That is how a foot was determined, I guess. A thumb, a hand, a span, a cubit, an ell, a fathom, great these measures based on human proportions. it is said to be four times the length of a pendulum swinging once a second (25cm) or one ten millionth of the distance from the North pole to the equator. The original proposition for the metre was indeed one ten-millionth of the length of a quadrant of a great circle passing through the North Pole and (some location in Paris), late in the 17th century. Louis the Somethingth promptly complained that he’d lost more territory to his surveyors than he’d won by the sword (and musket). Then things started getting complicated with trying to work out how non-spherical the Earth is (prolate or oblate) because France was too small to properly determine the “figure of the Earth”, so surveying expeditions were dispatched to the Baltic and Bolivia. Which is literally several books worth of unbounded joy, bliss and happiness. And malaria, death and misery (though I think the news about the efficacy of quinine did come back as a side-effect). Also at least one very dubious marriage. It all sort-of stalled as France decided to avoid the problem and have a Revolution instead. The project was picked up again in the Napoleonic era, but with the definition shifted to using a physical artefact instead of a measurement of the Earth. The pendulum thing I’ve heard previously, but I’m not sure it would have been workable in the 18th century. For starters, you’d need to control temperature (or use Harrison’s clock tricks of about 1745, if the British Navy would allow such sensitive technology to go abroad), air pressure (Toricelli and Pascal had a handle on that) and humidity (understood, but not well measured) in your pendulum chamber, then have a really good clock to ensure that your second was the same as someone else’s second. There is a problematic element of circularity there, so you’d probably need a good astronomical observatory with a good transit telescope there. Then there was one of the annoying surveying problems from the mid-18th century oblate/ prolate/ how-long-is-a-metre surveys – that mountains have enough mass to shift a plumb-bob from the vertical. Which distorts your measurement of star positions. Which distorts your survey of the Earth’s shape. And it also shows that the precision required is enough to be affected by local gravitational field strength variations (so geological gravitational surveys correct for some of this, producing a corrected gravity anomaly named the Bouger anomaly for one of the Andean surveyors mentioned above). And we’re back to square one, because the local gravitational field strength will affect the period of a pendulum. Complicated thing, the metre. Which is why they went for the “artefact in a safe” standard. For a century and a bit. Now it’s defined by a clock, to 1 part in 10¹⁵ or so. If mountains can shift your plumb-bob, then, even in flattish country, so can variations in the density of nearby rock masses (e.g. a buried granite dome). I think you alluded to that with your ‘local gravitational field strength variations’. Yes, you make adjustments for altitude (well, distance from the barycentre of the Earth) and local topography when mapping gravity, so that the normally plotted value on gravity maps is the “Bouguer” anomaly, M.Bouguer having been one of the people having “interesting times” in South America, determining the shape of the Earth. At the risk if breaking tha Roolz, one more comment. I’d take the dogs over the snakes any day. There is a line of logic that runs from the width of a horse’s arse to the lifting capacity of the Space Shuttle. But this margin is too small to contain it. that is not the original video. the video you show above it is probably the first version posted online. But it is not original source, nor (even forgetting about the audio) the original video. you should check better your info before posting it online. What makes you think it is not the original video? And what about the audio is even more dubious? Do you have some information about Dinda or Dumato? If so, please share. Thanks!